New Wazdan slots, 9 Lions Slot and Double Tigers Slot. Wazdan is an online casino software development firm that’s been making huge waves in recent months. The company’s digital slots portfolio is growing faster than ever. After releasing just 10 new games all year, 5 new slots from Wazdan have appeared in less than two weeks, with four more schedule for release on Sept. 18. Those efforts have not gone unnoticed. Wazdan’s powerful and graphically stunning portfolio of games are more widely available than ever before. The company has new contracts with more than a dozen online casinos this year already. They’re sure to grab before the year is out, earning four spots on the shortlist for the 2018 CEEG Awards, taking place later this month. Two of those new games hit Wazdan-powered online casinos yesterday, and they’re causing quite a stir. 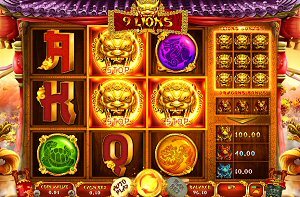 One if the new 9 Lions Slot, recipient of the ‘Hot Product Award‘ during its debut at G2E Asia in May. The other, a visual masterpiece, is the Double Tigers Slot. Inspired by Chinese legend and lore, this new slots game merges the mythological power of the dragon and the lion. The setting is a tranquil pagoda within a lush Zen garden. It’s a 3-reel, 8-line game, where each position on the 3×3 grid spins independently. Symbols include an array of dragon and lion emblems, and the usual A-10 playing card values. The game’s most unique feature is a Stop function that holds the high-paying symbols with the best odds of creating a win (even if they already won on that spin) for the following spin. Only thematic symbols, and the A, are eligible for the feature. In order to activate, there must be at least two of the same on the reels. The symbol that appears most will trigger the Stop. In case of a tie, the highest paying symbol is held. The game also includes a Lions Bonus and pick-me style Dragons Bonus. To trigger the Lions Bonus, you’ll need a golden lion head to appear in each position of the reels—not all at once, thankfully. That’s the easy part. Once the 3×3 grid to the right is filled, you’ll then need 3 lions to appear on the reels at once. The Stop feature helps here, but it can take a while. Once it does, you’ll receive 9 Lions Games. All Lions, including the first 3, remain on the screen for all 9 spins. (They are not free spins, by the way!) If the 9 spins end with 4 or more lions, you get a payout according to the pay table. 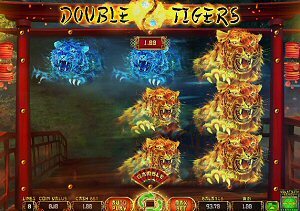 Double Tigers is one of the most unique and visually stunning games to hit the online casino realm in quite some time. This one is also a 3×3 classic slot, but there are only two symbols—the Orange Tiger and the Blue Tiger. With each spin, the reels will be covered in one of these symbols, or nothing at all. You’ll need to line up a trio of Blue or Orange felines, worth equal amounts, on any of the 8 paylines to win. Aside from Wazdan’s patented Gamble feature following a win, there’s only one special feature to the game. Players can choose the volatility at which they’d like to play; Low, Standard or High. A low volatility will result in more frequent wins, but with the smallest payouts. High volatility will see the fewest wins, but with much higher payouts. Standard is, of course, a balance between the two. 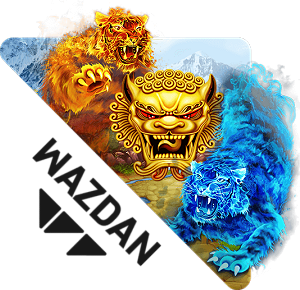 Both new Wazdan slots are available now at all of the brand’s licensed online casinos.